full disclosure: we have a nice bottle of wine’s worth of financial interest in EWC and about a dozen more crypto gaming efforts. I’m not a regular gambler. I simply appreciate the creative and business sides of gaming. and one of my favorites is at https://www.etherworldcup.com . It’s not even an ICO or TAO or anything like that. it’s a straight-up wagering use case. Unlike betcoin, bethereum and others, this live crypto use case doesn’t ask you to invest some new platform. They don’t need you to buy in to some unlikely roadmap and a marketing white paper. They don’t ask you to support their investors or staff or team, and they don’t want you to sing praises to some cryptocurrency pipedream. The thing Ether World Cup lets you do is place bets in ETH on FIFA World Cup matches, all the way through the championship tournament’s final match. And they do it better than anyone else. With its transparent, smart contracts on the blockchain, Ether World Cup (EWC) and the huge appeal of football/soccer make the value of running wagers or bets on EWC quite clear. And as all match results are verified externally by two independent verifiable sources, it means betters can rest assured that every step of the process is clear and confirmed. 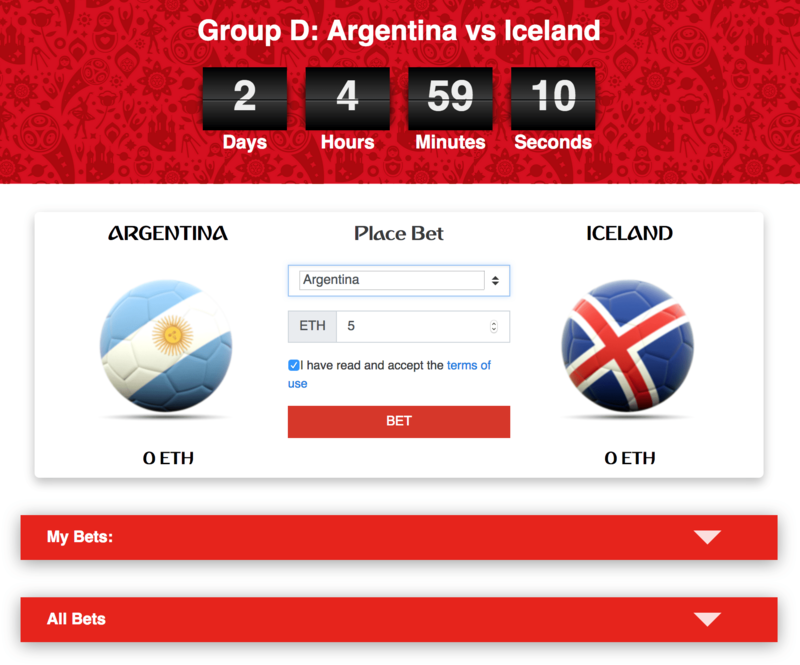 Again, for anyone who wants to wager with ETH, it’s simply the best betting site for FIFA World Cup matches. Now, without needing to wait forever on the promise of disruptive startups that may never see the light of day, actual sports betting fans can get their game on and win big with the popular cryptocurrency that brought the power of smart contracts to the blockchain. The World Cup is the world’s most-watched single sports event, every 4 years. Of course, World Cup betting adds up to noteworthy quantities and volumes of currencies. EWC cuts out unverifiable areas which happen with typical sports books middlemen, like traditional casinos. For gamblers into sports betting and specifically on football/soccer, the Ether World Cup caters to a huge need that is not handled in the same way anywhere else. And yes, as we wrote earlier, every bet on Ether World Cup is done with ETH smart contracts. That makes it virtually undisputable and lets you focus on the fun of the experience. Get reviews and offers from XDose by email. CAUTION! Mariah Carey LIVE in Dublin and London! XDose, © 1999 - Present. All Rights Reserved.